Cassidy is finally ready to risk her heart, but is she too late? Cassidy is a sweet young woman with a beautiful Christian faith that she demonstrates simply by the way she lives. Cassidy is smart, but seems to have poor judgment where men are concerned. Her past boyfriends have been a string of losers. Tristan has always been there to pick up the pieces of her heart. While Cassidy privately acknowledges Tristan’s importance to her, she refuses to take the step toward a romantic relationship with him. However, what Cassidy doesn’t see is that her reticence is pushing him away and she just might end up losing him anyway. In the midst of Cassidy’s turmoil, Keefe blows into her life and immediately begins pursuing her heart. No matter who Cassidy chooses, someone’s heart is bound to be broken. The love triangle between Cassidy, Tristan, and Keefe is very well done. I really had no idea who Cassidy would choose. Both men are smart, attractive and completely devoted to Cassidy. Keefe is sweet and romantic. Tristan has known Cassidy most of her life and they share a deep bond of friendship that has always hovered on the edge of romance. It is clearly a tough decision, and I was really looking forward to reading how she would choose between men who seemed evenly matched. Unfortunately, something happens towards the end that makes Cassidy’s choice incredibly easy. In fact, I’d say that the actions of one of the characters took the decision out of her hands entirely. I found this a little disappointing. However, I will say that I think she ended up with the right guy, and the ending was very romantic. The Fearful Heart has several entertaining secondary characters. I particularly enjoyed Cassidy’s roommate Billie and her odd romance with Ethan, a very large football player. I do wish that Ava, Cassidy’s nemesis, had been a bit more rounded. Most of her exchanges with Cassidy didn’t feel natural, and I thought the dialog between them was a little stilted. I will say that the end of the story hinted at more depth to Ava’s character, but it was almost too little too late. 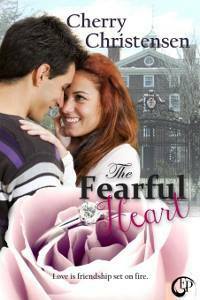 Overall, I enjoyed reading The Fearful Heart. Cassidy is a lovely young woman I’d be proud to call my friend, and I truly enjoyed watching her try to sort out her relationships with two interesting men. Fans of contemporary romance might want to check it out.